Hermann Rorschach was a Swiss psychiatrist who practiced and developed a branch of theoretical psychiatry around the turn of the last century. His core idea was to paint abstract inkblots that looked like he had hired Jackson Pollack to do the art. Pollack was the guys who threw a lot of paint on his canvases back in the 1950’s, rather than paint anything you could recognize. Many, infamously, considered him the leader of a school of art known as abstract expressionism. This is the form of art that many people thought was the newest wave, or the biggest joke ever played in the modern art world. Pollack and Rorschach were roughly contemporaries, and who knows who may have borrowed from whom? For Rorschach, the head shrink, and part time painter, the idea was to show patients abstract inkblots consisting of random shades and shapes. One way to understand this is to remember when you were young; lying in the grass on a warm summer day, looking up at the clouds and seeing tigers, lions, ice cream cones, and thunderheads in the random billows of white against the blue sky above. In a similar way, Rorschach would show patients his inkblot paintings, and ask them what they saw. So if you saw, oh, maybe your father looking like an evil warlock, then he would think you needed to work through some issues with your dad or whatever. I’m not so sure about the psychiatry, but his concept has always fascinated me. Photography’s power is its uncanny ability to look like the real thing, and of course the “real thing” is a matter of visual interpretation, The philosopher and physicist, Emanuel Kant, had a lot to say about our visual ability too, Kant thought that we never actually see any object in and of itself since our vision is always mediated by our senses. Your dog sees in black and white, and the housefly sees a kaleidoscope of pixelated domes. In any case, when I do work that is non commercial, just for the art of it, I like working with circus performers because they will put up with the meticulous lighting it takes do get the camera to record unusual effects, and to showcase their formidable skills in the air. In this case, the subject was Shayna Swanson, who was the first aerialist I ever photographed. The idea for this particular shoot was to show motion, after all, that’s what her art is all about—flying through the air on a high wire loop or dropping a large distance on a red circus silk hung from the high beams in my studio. 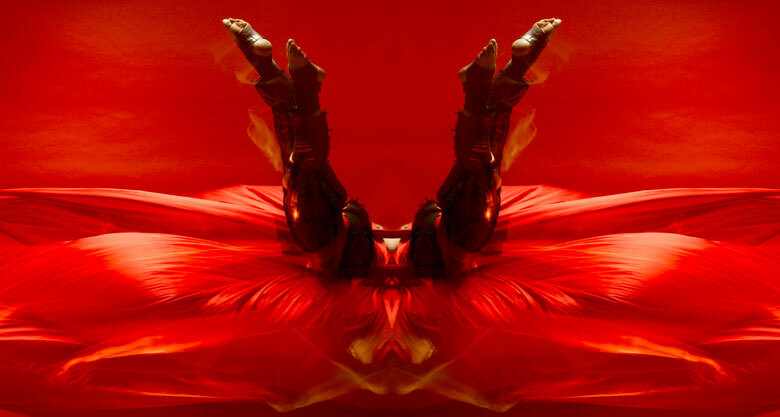 In this project, she was performing a 20-foot drop entwined in red silk and light. My goal was to capture the motion with a photograph. A still photograph that is by my definition: Still, a slice of time out of the never ending flow of connected moments, an endless river of seconds, minutes, and hours which define our life and how we live, and much later, at the very end, how we lived it. What is a moment after all, that one point that is the present now? Is it a second, or a millisecond, or a nanosecond? Hard to say, even harder to know. In this case, I slowed the shutter on the camera enough to blur Shayna falling, and during that long exposure fired a controlled sequence of strobe lights to catch thinner, ever thinner, slices of time. The image included with this essay is the one I found most compelling. When I look at it I’m not sure which way is up, or how many people are in there. I see arms, feet, legs, light, and a digital nod to Rorschach the artist. Sometimes, I see a frog’s head viewed from above in the lower half of the image, and sometimes, I think of Georgia O’Keefe’s famous flowers. Hey, maybe I’ve got some issues with frogs and flowers, who knows? In any case, I like looking at it, and I see different things all the time. Let me know if you see anything else in there, maybe we can start a whole new school of art psychology. You never know, one thing can lead to another; it’s just a matter of time.